Each year, we conduct monitoring programs on our field camp on East Limestone Island. The data we gather with the help of our volunteer citizen scientists, provides us with long-term information on the biology and health of Haida Gwaii ecosystems. Our research focus is the Ancient Murrelet, but we also collect data on marine bird and marine mammal populations, intertidal invertebrates, plants, forest birds and the impact of introduced mammals on island ecosystems. Burger, A. E. 2002. Conservation assessment of Marbled Murrelets in British Columbia: review of the biology, populations, habitat associations, and conservation. Technical Report Series No. 387, Canadian Wildlife Service, Delta, BC. **NEW! ** Chollet, S et al. 2015. Long term consequences of invasive deer on songbird communities : going from bad to worse? **NEW! ** Chollet, S et al. 2015. Positive plant and bird diversity response to experimental deer population reduction after decades of uncontrolled browsing. **NEW! **Nelson, A. et al. 2016. Migration Patterns ofSan Francisco Bay Area Hermit Thrushes differ across a fine spatial scale. Piatt, J.F. et al. 2006. Status Review of the Marbled Murrelet (Brachyramphus marmoratus) in Alaska and British Columbia. U.S. Geological Survey Open-File Report 2006-1387. Papers in peer-reviewed journals based either wholly or in part off of work by LBCS volunteers and staff. The LBCS research on Ancient Murrelet is the only study of this species anywhere that has provided detailed population data, including adult and juvenile survival and reproductive success and one of very few studies of any marine bird species that demonstrates clear links between different demographic parameters and provides all the relevant parameters for demographic modeling. This type of data is available for very few COSEWIC-listed species. Given the difficulties of working on the species, this is a remarkable achievement. 1994 Gaston, A.J. Status of the Ancient Murrelet, Synthliboramphus antiquus, in Canada and the effects of introduced predators. Can. Field‑Nat. 108: 211‑222. 1997 Gaston, A.J. Mass and date of departure affect the survival of Ancient Murrelet Synthliboramphus antiquus chicks after departure from the colony. Ibis 139: 673-678. 2001 Gaston, A.J., Smith, J. Changes in oceanographic conditions off northern British Columbia (1983-99) and the reproduction of a marine bird: the Ancient Murrelet (Synthliboramphus antiquus). Can. J. Zool. 79: 1735-1742. 2002 Hazlitt, S. and A.J. Gaston. Black Oystercatcher natal philopatry in the Queen Charlotte Islands. Wilson Bulletin 114: 520-522. 2003 Gaston, A.J. Influence of chick mass and date of departure from the colony on adult characteristics in a precocial seabird. Auk 120: 818-826. 2006 Gaston, A.J., Stockton, S.A. & Smith, J.L. Species-area relationships and the impact of deer-browse in the complex phytogeography of the Haida Gwaii archipelago (Queen Charlotte Islands), British Columbia. Ecoscience 13: 511-522. 2011 Gaston, A. J. and S. Descamps. Population Change in a Marine Bird Colony is Driven By Changes in Recruitment. Avian Conservation and Ecology 6(2): 5. This paper is a major summary of the demographic work on Ancient Murrelets carried out at East Limestone Island during 1990-2010. 2012. Shoji A., Yoneda, M. and Gaston A.J. Ocean climate variability links incubation behaviour and fitness in Ancient Murrelets (Synthliboramphus antiquus). Can. J. Zool. 90: 362-368. 2014 Le Saout, S., S. Chollet, S. Chamaillé-Jammes, L. Blanc, S. Padié, T. Verchere, A. J Gaston, M. P Gillingham, O. Gimenez, K. L Parker, D. Picot, H. Verheyden, JL. Martin. Understanding the paradox of deer persisting at high abundance in heavily browsed habitats. Wildlife Biology 20: 122-135. 2015 Chollet, Simon, Carita Bergman, Anthony J. Gaston & Jean-Louis Martin. Long-term consequences of invasive deer on songbird communities: Going from bad to worse? Biological Invasions 17: 777-790. 2015 Gaston, A.J., J. Pattison and A. Brown. Impact of a major forest blowdown event on breeding of Ancient Murrelets Synthliboramphus antiquus at a colony in Haida Gwaii, British Columbia. Can Field-Nat 129:285-289. 2008 Gaston, A.J., J-L. Martin, T. Golumbia and S. Sharpe (eds.). Lessons from the Islands: introduced species and what they tell us about how ecosystems work. Environment Canada, Ottawa. This compilation grew out of a symposium organised jointly by LBCS and RGIS. It includes several studies involving work by LBCS and provides a summary of Introduced Species studies and issues in Haida Gwaii. 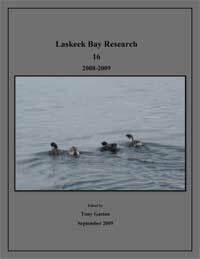 2002 Burger, A. E. Conservation assessment of Marbled Murrelets in British Columbia: review of the biology, populations, habitat associations, and conservation. Technical Report Series No. 387, Canadian Wildlife Service, Delta, BC. 2006 Burg, T.M., A.J. Gaston, K. Winker and V. L. Friesen. Evolution in peripheral populations: population genetics of the chestnut-backed chickadee. Molecular Ecology 15: 2409-2415. 2006 Piatt, J.F. et al. Status Review of the Marbled Murrelet (Brachyramphus marmoratus) in Alaska and British Columbia. U.S. Geological Survey Open-File Report 2006-1387. 2016 Chollet, S., Padié, S., Stockton, S., Allombert, S., Gaston, A.J. and Martin, J.L. Positive plant and bird diversity response to experimental deer population reduction after decades of uncontrolled browsing. Diversity and Distributions, 22(3), pp.274-287. 2016 Nelson, A.R., Cormier, R.L., Humple, D.L., Scullen, J.C., Sehgal, R. and Seavy, N.E. Migration patterns of San Francisco Bay Area Hermit Thrushes differ across a fine spatial scale. Animal Migration, 3(1), pp.1-13.